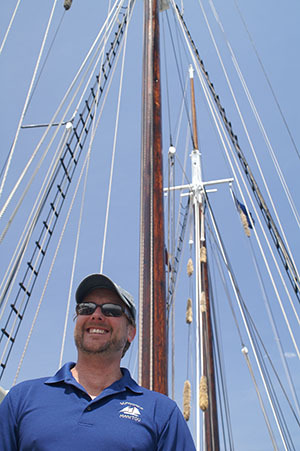 The Faces Behind the Places of Traverse City – Dave McGinnis, Traverse Tall Ship Co. 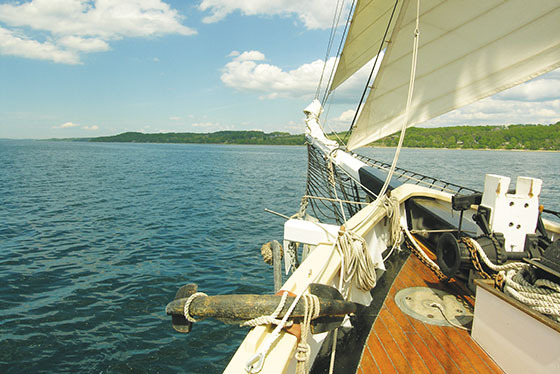 If you&apos;ve ever looked out onto West Grand Traverse Bay on a summer day it&apos;s fairly certain that you&apos;ve seen a majestic schooner sailing through the waves with her sails raised high and her compass set for True North. Today, we&apos;re talking to Dave McGinnis - Owner, Senior Captain and the man behind the scenes of the mighty vessel, Tall Ship Manitou, and Traverse Tall Ship Co.
Dave McGinnis, Owner and Senior Captain of Traverse Tall Ship Co.
TCT: "How did you end up making your way to Traverse City?" DM: "The Manitou, actually. She was originally out in Burlington, Vermont and I was her First Mate. 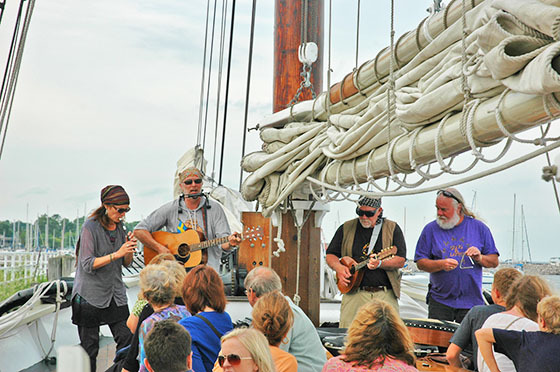 In 1990, when John Elder, the previous owner of Traverse Tall Ship Co., purchased her and needed to sail her back to Traverse City, I jumped at the chance to be a part of the crew. I was made Captain of that trip, sailed her through the St. Lawrence Seaway and around the Great Lakes and brought her here to Traverse City." TCT: "And what was your first thought of Traverse City when you got here?" DM: "When I first heard the boat was headed to the Great Lakes I pictured it sailing around in an "industrial rust belt". I had absolutely no idea how beautiful Michigan was, Traverse City especially. There was a short time where I moved to Maine for work and once I was away from Traverse I realized even more how special it was - so I came back fairly quick!" TCT: "What are some of those reasons that makes Traverse City so special to you?" DM: "I am in love with this town and this area - the beaches, the blue waters, the food and the culture that we have (especially for the size town that we are) - you couldn&apos;t ask for a more well-rounded place to be." 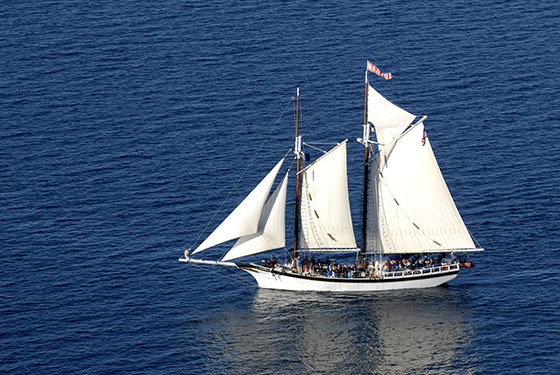 A perfect day for a sail on the Tall Ship Manitou in West Grand Traverse Bay. TCT: "How is it that you pursued sailing as a career?" DM: "I grew up in New Jersey heading to Normandy Beach every summer to our summer home. That&apos;s where I really fell in love with the water (after being fairly tentative around it during my early years - I actually didn&apos;t learn to swim until I was nine years old). I went to college to study photography and I came across the windjammer overnight cruises you could go on. After saving up as much money as I could I went out on my first trip, and then another one. When the ship had an opening in their crew a couple years later, I went for it. By then, the captain knew who I was and knew that I was serious about sailing and being on the boats. I&apos;ve been sailing ever since." 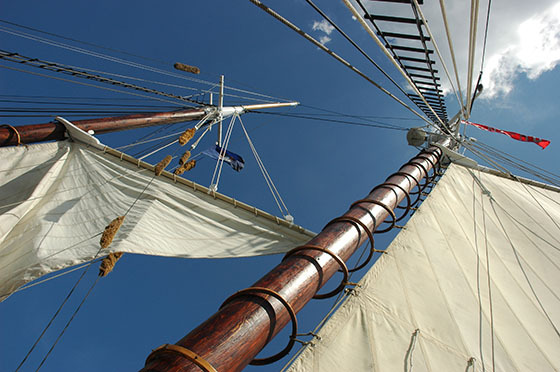 A fantastic shot looking up at the craftsmanship of the Tall Ship Manitou. TCT: "What do you find to be the most rewarding part of your job? DM: "I honestly fell in love with the romance of these classic schooners. I&apos;m somewhat of a history buff and these old vessels give people a taste of what it was like to sail the seas 100 years ago. I feel lucky every day that I can offer an opportunity for average citizens and visitors to have access to the bay." TCT: "We have to ask (as we do with any of our community guest profiles) - any fun facts that most people don&apos;t know about you?" DM: "Hmm. I love Japanese monster movies (especially anything with Godzilla) and I hate rats. I&apos;ve also started to learn about and drink single malt scotch - which I really enjoy!" Tags: sailing, summer, Traverse City, Traverse Tall Ship Co.